Tongue cancer is a serious type of oral cancer that can be cured if diagnosed at an early stage. Learn its symptoms, causes, treatments to cure it quickly. Tongue cancer is among the most dangerous and common of all types of oral or mouth cancers. If the cancer develops in the starting two-thirds of the tongue, it is termed as a kind of oral cancer, but if it forms in the throat then it is classified as oropharyngeal cancer. Men are more likely to suffer from oral cancer than women. Cancer of the tongue can be cured completely if it is diagnosed at an early stage. 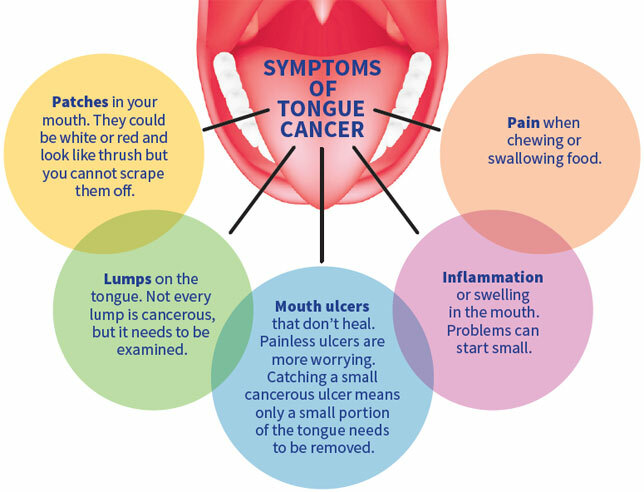 Learn how to identify tongue cancer symptoms and how to deal with it. Tongue cancer symptoms bear an uncanny resemblance to that of many of the other kinds of oral cancer. It is common for people to think that it is a sign of persistent cold or a mouth sore that isn’t healing quickly. The following are some of the other symptoms that are associated with tongue cancer. This type of cancer usually looks like tongue lesions and can be bright red in color. Another way this can appear is in the form of red patches that are located underneath the tongue on the floor of the mouth. The following picture can give you a clearer idea. Note that cancer is not the only condition which can cause these symptoms. Therefore, it is essential that you see a doctor immediately if you experience these symptoms to get the right diagnosis. Although the exact reasons for tongue cancers remain unknown, there have been a number of risk factors that may lead to them. Transmission of the HPV virus via sexual contact is one of the risk factors for cancer while in the western world, tongue cancer can be caused because of alcohol abuse and smoking any kind of tobacco whether it is pipes, cigarettes or cigars. People over the age of 40 are more prone to get this type of cancer and it usually affects men more than it affects women. Squamous cells are present on the lining of the throat, mouth, thyroid, nose and the larynx. They are similar skin cells and are usually flat in appearance. Cancer that begins in these cells is called as Squamous Cell Carcinoma (SCCA) and it is the commonest type of tongue cancer. Cancer of the tongue is usually diagnosed through a biopsy. It is a simple procedure in which the a sample of the tongue tissue is taken and examined under a microscope to see if there are any abnormal cells present in it. The biopsy can take up to two weeks. Once the diagnosis of the cancer has been confirmed by the biopsy, further tests are done to check if the cancer has metastasized further to the lymph nodes present nearby. CT scans and MRIs are done to check if the cancer has spread even further into the body. The reason for these tests is to determine the stage of the cancer. Diagnosing tongue cancer at an earlier stage can help in treating it more effectively and there is every chance that you will get cancer free. There are a number of treatments available for this type of cancer which depends on the stage of the cancer you are in. The following are some of the treatments that are used for treating cancer of the tongue. If the tumor causing the cancer in your tongue is a small one then the best means of treatment for it is surgery. The doctors try to use minimally invasive procedures to perform the resection of the tumor from the tongue. Since the entire tumor has to be removed from the tongue, the surgery might affect the speaking and swallowing capabilities of the patient. If the tumor is of a larger size then surgery will have to be aided by radiotherapy as well. In addition to the tumor present on the tongue, the lymph nodes present on either side of the neck would also have to be surgically removed to ensure that the cancer does not come back. After the surgery, radiotherapy will be performed under the supervision of an oncologist to make sure that no cancer cells are left behind. Chemotherapy involves the use of anti-cancer drugs for killing the cancerous cells. The use of chemotherapy becomes necessary if tongue cancer has metastasized to the nearby lymph nodes present in the neck. Chemotherapy is often performed alongside radiation therapy to get the best possible results. Different types of anti-cancer drugs can be used in combination with each other during chemotherapy to attack and destroy the cancer cells. Targeted drug therapy has been designed to attack the cancer cells on a molecular level. This treatment method is not administered alone and is usually combined with radiotherapy and chemotherapy to form a comprehensive plan for the treatment of tongue cancer.